Keeping the hand warm this winter! My hand is my worse enemies when it becomes to keeping it warm. I have ridden my mountain bike in 26F and snow on the ground but condition is slightly different. At this year’s Chattjack 31 everybody had a difficult time finding the right outfit to wear until the race day. I already had enough wardrobe transported it but I already knew in my mind my choice of outfit would be. Despite all the decisions my hand didn’t handle well. As I pass the finish line I start to getting colder but my finger tips had light frost bites from 6hr26min on the Tennessee river. The race was held on 10/28 and unfortunately after two weeks past in both hands three of my finger tips is still an issues. Light nerve damages from light frost bites. I was visiting my local outdoor store “Quest Outdoors” just yesterday and talking about my Chattjack 31 race experiences to my friend/owner of the shop. Just about all the people I was talking to just said “Yeah, you got frost bite”. One friend/staff said “I had guy went to mountaineering trip last year and till this day he still has issues with his hand from same kind of frost bites”!. Not the best information I need it but what you gonna do about it. I met a new staff David who handles the fly fishing department at the store overhearing my hand issues. He had some suggestions on gloves so for the first time I headed to the fly fishing department. 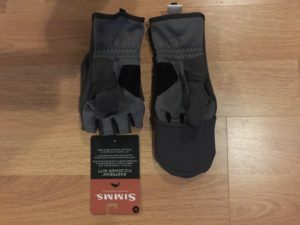 He introduce me a brand called “Simms Fishing” and had this cool PolarTech fabric with mitt conversion gloves. I been wearing many of waterproof gloves in layers but never worked well for even 60min-75min Paddle Monster training. Enough that I can get out the water but depending on air temperature I always struggle to find the right glove combination. This fall was on my list to find a new gloves to try before the winter program starts and I think I found one to try. 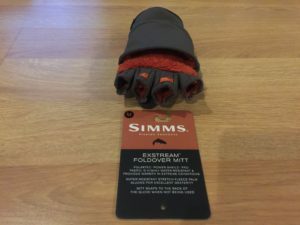 Glove is called “EXSTREAM FOLDOVER MITT” by Simms Fishing Products. Polartech Power Shield Pro which is water resistant and Polartech is quite known as nice fleece style for warmth. 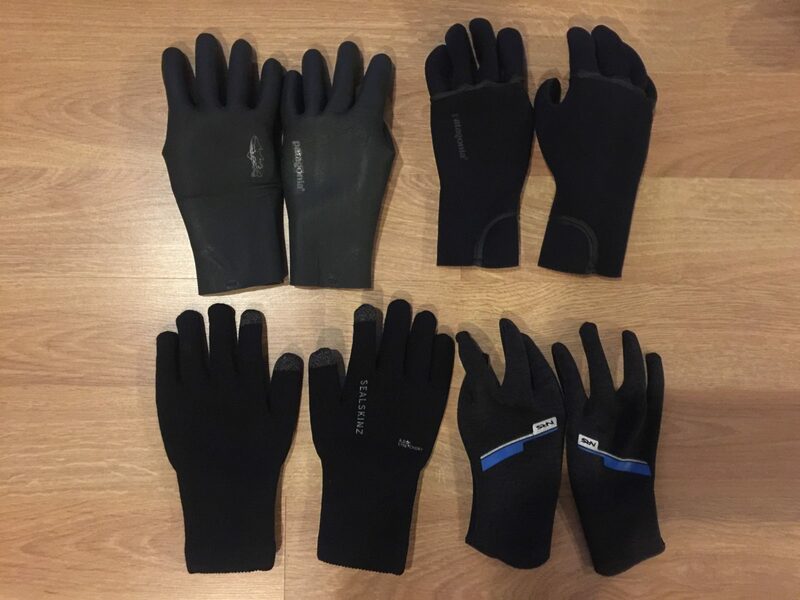 Overall gloves is stretchy , easy to slide in and also little added bonus is that there is a small pocket to put your “HOTHAND hand warmer”(located at your wrist area). Mitt snaps to back of the gloves so if you need a hands for your phone to take gorgeous sunset/sunrise winter photos then you do not need to take your gloves off to have full fingers. Only down side is that it’s not waterproof but I personally rarely dip at my lake so I think I can compromise it. Plus I’m not far from any land for emergency stops and I’m already wearing my drysuit in cold weather anyway. ← Paddle Monster 2 weeks of active rest is over!